Minimalist cushy running shoes have been all the rage lately but many brands have struggled to create a comfortable but tough pair of trail running shoe with this design. It’s no surprise that Patagonia is one brand that really achieved the goal of a lightweight, protective trail shoe that fits flexible like a glove. 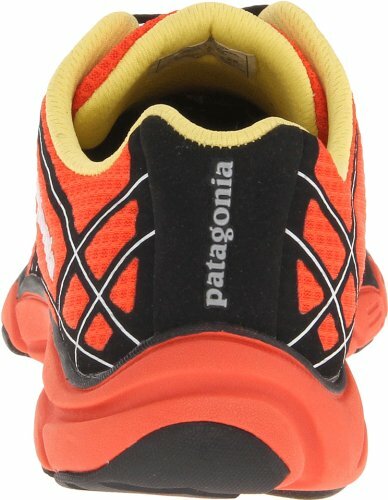 The EVERlong trail running shoe is a versatile piece of running shoes that combines the best features of traditional road shoes, and trail shoes. The EVERlong has the typical soft cushy midsole and lack of a rock plate that road-racing shoes have but the smooth traction and snug fit required of a good trail shoe. Patagonia ambassador and co-designer Jeff Browning (well known as an ultrarunner) greatly helped with the creation of this minimalist pair of shoe and tested out numerous prototypes under harsh wear conditions. At the time of this model’s creation Browning had been exclusively wearing these for his 100 mile races with great success. Finding a comfortable trail running shoe is often more difficult for women since the sport has more men, and therefore brands tend to focus on men’s running shoes. This racing shoe is a true performance shoe and both the men’s and women’s version are equally well-designed. The casual train runner will definitely enjoy the shoe just as much as a competitive racer. It is reasonably priced the high quality of this shoe and has a decent good lifespan for the average wearer. If you’ve been looking for a new pair of flexible shoes to wear, check out some of the features and advantages the EVERlong shoe design offers. 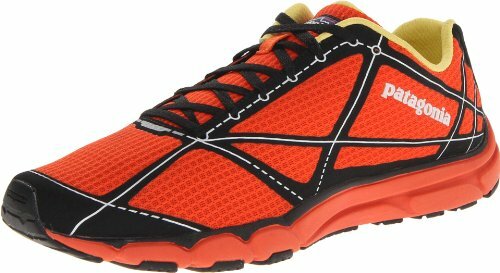 This is a popular shoe for runners who want a light shoe that can still handle the rigors of trail running. The EVERlong really comes out on top of the competition in that category. Welded air mesh upper is breathable and provide stability without rigidity. Your feet will be able to breath and discomfort from seams isn’t an issue. The Patagonia logo on the back of the shoe is reflective for safety. The collar of the upper is made of Dri-Lex which wicks moisture. Both the collar are the mesh tongue lining have been treated with Aegis Microbe Shield to control odors. A 4mm heel to toe drop helps to set up your foot for the proper midfoot or forefoot strike. This propels you forward and protects you from injury caused by heel striking. The EVA footbeds are removable and are perforated for even a bit more of breathability. The softer footbed really hugs the foot and over time will fit your anatomical shape very well. It offers plenty of support and is also treated with Aegis Microbe Shield for odor control. The sole has built in heel pods which provide a light cushion for comfort. A minimalist stick rubber outsole was used to provide some traction without being too aggressive or adding a lot of extra weight. If you look at the sole you will see wear zones which are durable and will prevent excessive breakdown. The EVERlong Trail Running shoe is much lighter compared to others. The EVA midsole is 25% lighter than traditional materials used. The shoe has a minimalistic feel to it but isn’t a barefoot shoe. It feels form-fitting but not overly tight on the foot. It has a good grip to it and with the proper sized shoe there won’t be any sliding while running. The shoe looks great and the 3 color options include a bright coral red as well as two neutral blue and grey tones. It is a sleek looking shoe and while it doesn’t quite stand out from the competition in looks alone, it’s comfort and fit make it a reliable piece of gear. Running trails in warmer weather isn’t an issue with a good pair of wicking socks. The shoe’s welded air mesh upper and tongue, as well as the perforated footbed, really help push out moisture and heat with every step. The Dri-Lex collar and tongue feel good against the skin and won’t chafe. The collar and tongue also are water-repellent. The footbed is cushioned enough to be comfortable but not so soft you can’t feel the ground under you. It is contoured for the female foot and after the breaking in period it will fit even better. The EVA foam used in the footbed is made of 20% recycled materials which is a benefit for those who are eco-conscious. While this minimalist shoe is best saved for groomed/packed or easy trails, it does perform well on more difficult terrain and road running. The midfoot designs wrap the foot very smooth to provide stability and the internal heel pods keep your heel comfortable when running downhill. The outsole rubber gives plenty of traction in the toe for a good grip running uphill. Minimalistic certainly doesn’t mean weakness. This shoe is very durable and isn’t going to break down after you wear it for a season. The EVERlong is a great shoe for women who are new to trail running or need a lightweight shoe specifically for easier trails. Since it looks great and is versatile in design it can also perform double-duty as a walking/jogging/running shoe on pavement or just for casual use on errands between runs. Some claim this is more of an introductory trail running shoe but the shoe design certainly can perform well as ultrarunner Jeff Browning has proven. For the purposes of ultrarunning races, it is best these shoes be replaced after 100 miles of harsh, heavy wear. There really isn’t anything bad about this shoe but there is one concern is a lack of a rock plate. Even a minimal rock shoe is expected in many trail shoes but this model doesn’t have one. This is the reason it is recommended that this shoe is used for easier trails or softer road running, depending on the runner. Some runners who are used to a minimalistic or even a barefoot shoe probably won’t mind. The EVERlong feels just as great as it performs when you use it for the purposes it was designed for. Most users find that this model fits true to size. With right size it is impressively snug and comfortable, but non-restrictive. It feels soft on the foot and very lightweight but isn’t going to make you feel out of control or not protected which going up or down hills or over difficult terrain. Many users also find that the shoe had an almost non-existent breaking in period compared to other trail shoes. There were no blisters or soreness and within a few hours of use it felt like an old favorite. If you like the style of a road shoe turned trail shoe or just enjoy a good-quality minimal trail shoe, the EVERlong is a great choice. While Patagonia no longer sells this model, it can be found for a very reasonable price through other retailers.